Stunning "Crystal Classic" Mothers Bracelet created with gorgeous clear AB Swarovski crystals, silver rounds and bali spacer beads. A real beauty. 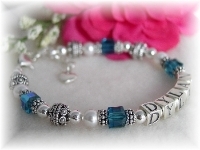 Stunning "Crystal Classic" Mothers Bracelet created with gorgeous clear AB Swarovski crystals, silver rounds and bali daisy spacer beads, giving it a fabulous "chunky" look and feel. 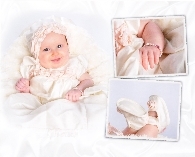 Single and double strand bracelets include a heart clasp. Triple strand bracelets will have an upgraded sterling silver triple strand clasp as shown in "More Images" above. Extender chain and charm optional. 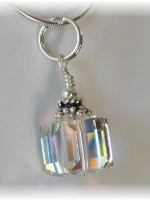 Beautiful Crystal AB pendant with your choice of 16" - 24" sterling silver chain. 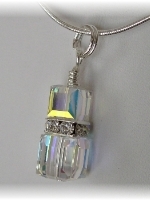 Beautiful Large 12mm Crystal AB cube pendant with your choice of 16" - 24" sterling silver snake chain.